Prior to and during assembly of the instrument, there are a number of instrument subsystems that require characterization and documentation. The areas of the diamond-turned aluminum apertures were measured at NIST using the non-contact geometric aperture calibration facility described by Fowler, Saunders, and Parr (1998). The four TIM apertures have geometric areas 0.49928, 0.49938, 0.49936, and 0.49926 cm2 with relative standard uncertainties of 25 ppm. This aperture area is corrected for temperature changes, diffraction, and bulk modulus expansion to the space environment. The dominant TIM aperture area uncertainty is from a diffraction correction to account for light lost due to diffracted by the aperture edges. This correction is 430 ppm and has a 10% uncertainty. A platinum resistive thermal device (RTD) measures the flight apertures’ temperature needed for thermal corrections to the area, which are known to about 12 ppm. The effective solar-weighted reflectances for the four TIM cavities are very low, with values of 169, 139, 307, and 360 ppm with uncertainties of 14%; this means the cavity absorptances (light collection efficiency) is approximately 99.98%. These ground-based calibrations of absorptance are tracked for relative changes on-orbit, as described in Flight Calibrations. Cavity reflectance is measured using laser scans mapping the cavity interiors at six wavelengths (457, 532, 633, 830, 1064, and 1523 nm) spanning the primary solar spectrum. A spatial map of cavity reflectance from a 2-dimensional laser scan is averaged over the region of the cavity illuminated by sunlight to obtain an effective reflectance at that laser wavelength. The laser measurements are supplemented by a broad-beam laser calibration at 10.6 µm. A spline fit of the reflectance interpolates between the discrete laser wavelength calibrations. 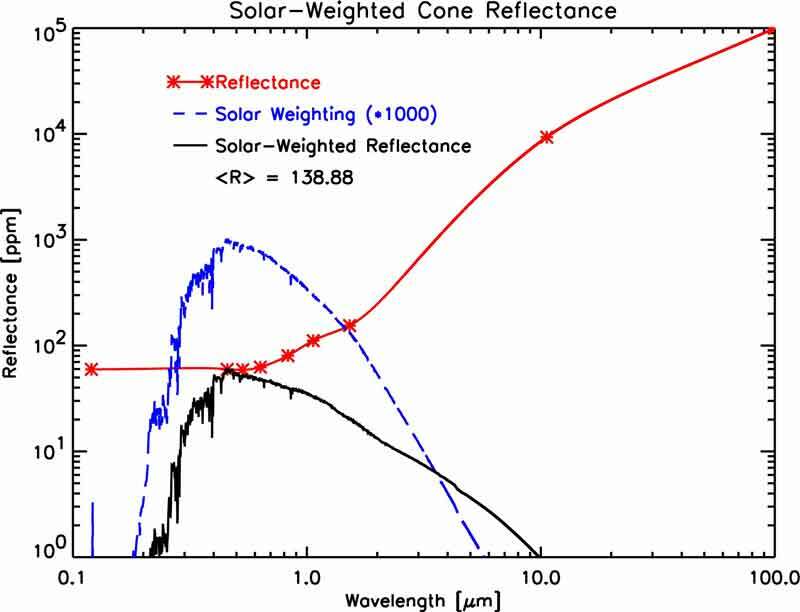 The effective cavity reflectance is the average of the reflectance measurements at individual wavelengths weighted by the solar energy distribution, as shown by the Cavity Reflectance Figure below. NIST measurements of select cavities from 2 to 20 µm show that the cavity reflectance varies smoothly with wavelength continually through the mid-infrared. The electrical heater power applied to each ESR comes from pulse width modulating the voltage from an extremely stable 7.1 V reference buried Zener diode. This power is applied into a cavity heater having low resistance sensitivity to thermal changes. Both the voltage references and the resistive heaters are calibrated prior to launch. The stability is checked via partial redundancy on the spacecraft instrument and via ground witness samples. In addition to the TIM instrument on the SORCE spacecraft, there are two other assembled TIM instrument ground witness units. One is maintained in a LASP cleanroom, and the other is intended for intercomparisons to other calibration facilities or instruments. Ground witnesses of the critical components used in the TIM are maintained, including spare flight apertures, voltage references, and absorptive cavities. 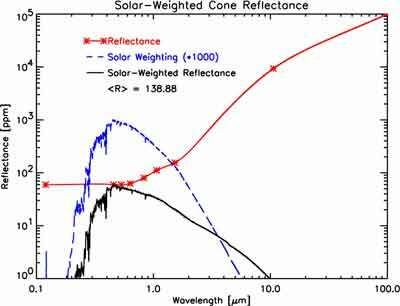 More details on the ground calibrations are described by Kopp, G., Heuerman, K., and Lawrence, G., “The Total Irradiance Monitor (TIM): Instrument Calibration,” Solar Physics, 230, 1, Aug. 2005, pp. 111-127.